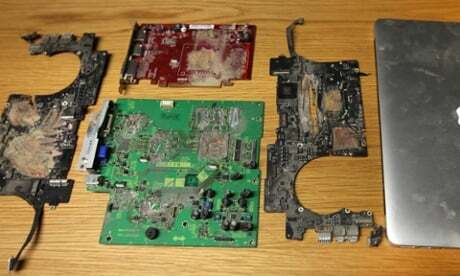 The Guardian’s picture of the computers it claims to have smashed in order to placate the British government over the Snowden affair has been called into question over both what it shows - and what it doesn’t. Guardian editor Alan Rusbridger yesterday revealed that GCHQ operatives last month paid the paper a visit in order to vet the wrecking of one or more computers so that the encrypted contents of their hard drives could no longer be accessed and perhaps one day "fall into the wrong hands". A follow-up story featured a snap of the “remains of a computer that held files leaked by Edward Snowden to the Guardian and destroyed at the behest of the UK government”. The picture certainly shows the remains of a MacBook: its casing - said separately by Rusbridger to be a MacBook Pro, but which might actually be an Air; it looks too thin to be a Pro - and its motherboard. But Guardian snapper Roger Tooth’s photo also contains what is clearly a second MacBook mobo, along with an old graphics card - an AMD job, we’d say; you can see the three output connectors on the backplane - and another motherboard, possibly a small desktop computer or maybe another device, given the large areas empty of circuitry. The larger of the three motherboards seems too small to have played host to the graphics card, suggesting the Guardian picture shows the remains of at least four computers - and incomplete ones at that. The snap is alas too small to identify the graphics card and larger of the three motherboards precisely. But even at this size, it’s clear there is no sign of either hard drives or solid-state storage. Given the vigour with which “a senior editor and a Guardian computer expert” clearly applied themselves to the destruction of the devices that’s perhaps not surprising - these components must have been reduced to invisible dust. According to the paper, its two staffers “used angle grinders and other tools to pulverise the hard drives and memory chips” while being watched by GCHQ techies “who took notes and photographs, but who left empty-handed”. If that’s the case, why does the Guardian picture show so little of the three, possibly four machines? There’s not much beyond motherboard, storage and memory inside modern Mac laptops, but what about the desktop’s or desktops’ wiring, power supplies, fans, chassis, optical drives and casings? The picture’s caption originally said the shot showed the defiled drives, but was changed when readers pointed out that it ... er... didn’t. Nor does the Guardian’s second story explain why the paper’s computer specialist felt the need to vent such spleen on a graphics card which surely couldn’t be used to cache Snowden’s encrypted leaks. The apparent destruction of chippery on the pictured boards could lend credence to wild conspiracy theories to the effect that the world's major spook agencies could even read information out of RAM after it has lost power, perhaps through some ultra-advanced scanning of residual quantum ghosts in the machine. Or maybe they simply feared that if they didn't destroy all the chips they might miss a non-volatile one. Rusbridger himself describes the destruction as a “peculiarly pointless piece of symbolism”, not least because he admits the paper has plenty of other copies of the Snowden files. However GCHQ has apparently been happy to take his word for it that the only ones on UK soil (outside Cheltenham, anyway) have now been extirpated. A more cynical observer than an El Reg reporter might conclude that that the Guardian staff simply grabbed a handful of IT department cast-offs of the kind all large organisations have lying about somewhere and set about destroying them for the spies' benefit. Why, we wonder, did the GCHQ team fall for it? Or perhaps there was a subsequent mix-up at the Graun picture desk. According to Rusbridger, the GCHQ team “never touched the hard drives” so presumably had take the Guardian’s word that the computers contained the contentious content the government would rather we didn’t see. 2. Our public key can be found here (shasum: 98ab912443743c1bba4536e817725d566d64d5fa) and below for those not wishing to flag themselves up by visiting the specific page.